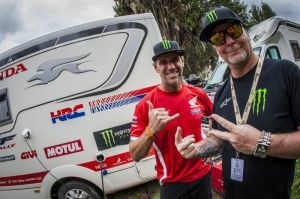 The participants of the Dakar Rally 2017 were spared another early-rise this morning and got to put their feet up in La Paz, Bolivia. The mechanics were today able to check over the Honda CRF450 RALLY with greater calm than usual. The machine has shown great resilience and performance over the first week of competition. The team and bike now look poised to attack over the next few stages which kick off with the marathon stage tomorrow. As usual, riders will not be allowed to receive any external mechanical assistance from the close of tomorrow’s stage in Uyuni to the following day. The rally begins its return trip by heading towards what has become one of its regular stomping grounds since 2014. The Uyuni casern, which is well known to the raiders, will once again be transformed into a bivouac for a day. For this first part of the marathon stage, which will include very long sections of sandy tracks, the service park will be open to all vehicles, except for those entered in the assistance category.